After 20 years of running events in Edinburgh’s most flexible event space, Paul DeMarco and Scott Snedden were in a great position to start their latest project … the Big Big Gin Festival. This expertise, coupled with a burning desire to create amazing customer experiences, leads them to find ever-more creative ideas for the perfect event. The creation last year of their inaugural gin event, The Big Big Gin Festival, came rather by chance. For the past 2 years, the team had hosted a successful gin event run by another event business. Unfortunately, this business ceased to trade, leaving them just 8 weeks to the planned event and the prospect of a weekend with no booking. Very quickly initial chatter of whether they could run their own gin event grew arms and legs. Time was against them, but the full team were determined to pull off an amazing gin event they could all be proud of. They quickly identified a few key factors. The first being that whatever they created had to be sustainable and be able to be replicated a couple of times a year. It would need to have its own identity and brand, so much time was spent developing this and setting up The Big Big Gin Festival website. It was also important to create an event concept that would put the customer first and again, they put a great deal of thought into designing how the festival would look. Then the components of the customer journey, what they would see, hear, learn and – of course – taste! They quickly found that brands were happy to come on board and the team had some amazing support to help get the first event of the ground. One of the key considerations in choosing exhibitors was that the brands had to have a real passion for their product, so they could truly engage with the audience through sampling and workshops. For the brands, it’s also an excellent opportunity to get feedback first-hand. And to add to the gin experience they had great live music on the big stage and on-trend finger food to complement the array of gins on offer. They also offered something that is often missing from gin festivals – seats! Yes, they ensured visitors had somewhere to sit and relax while enjoying their gin, food and entertainment. Despite having a capacity of 3,000, it was decided to cap tickets to 500 per session, so that the event was not too busy. For many people, it’s important to be served quickly or able chat to any of the experts. There was even a shop, where attendees could buy gin or gin-related merchandise to take home. 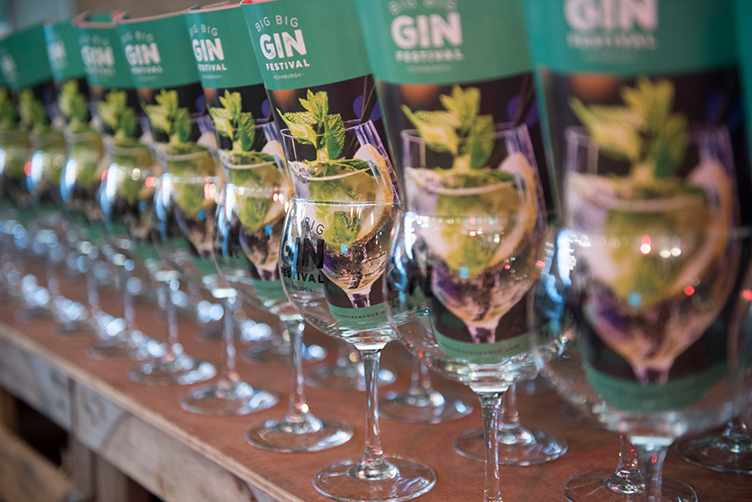 The Big Big Gin Festival tickets include a free keepsake glass and a complimentary gin of your choice mixed perfectly with a premium Fevertree tonic … the biggest problem was choosing which gin out of more than 100 you wanted! The Scottish Gin Society attended the festival last year. As you’d expect, we’ve been to our fair share of gin events, and this one instantly struck us as something very special. The great organisation made attendance a real pleasure, the atmosphere was a chilled-festival vibe, and the selection of great gins was truly jaw-dropping! Never a company to rest on their laurels the first thing the Corn Exchange team did post event was to get feedback from as many sources as possible to make sure show number 2 is bigger and better than before……. we wonder how this could be possible, but we will certainly be heading along to The Big Big Gin Festival on 26th and 27th April at Edinburgh’s Corn Exchange to find out! Tickets for the event are ust £15 and you can buy yours here.